LAWN VACUUM, BILLY GOAT S.P. Designed for vacuuming leaves, grass clipping, and other types of organic debris. Dependable 6.5 hp Honda engine. 28" wide x 62.5" long x 45.5" tall. Re-usable mesh bag holds 40 gallons of debris. Optional hose kit is available for clearing debris from around bushes, trees, foundations, fences, etc. 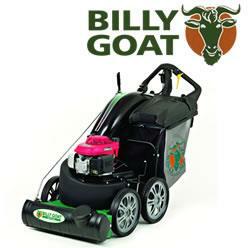 * Please call us with any questions about our lawn vacuum billy goat s.p. rentals in Oak Grove MO, Blue Springs MO, Independence MO, Lexington MO, Odessa MO, Independence MO and Western Missouri.